The Ultimate Collector Series, or UCS for short, of LEGO sets tends to focus on the Star Wars brand. These UCS sets are the gold standard by which Star Wars sets are judged. They tend to have a much higher piece count and are much more detailed than the standard run of the mill sets. In 2000 the earliest Ultimate Collector Series began with the 7181 TIE Interceptor and the 7191 X-Wing. Like my previous article Brick by Brick, Breaking Down Expensive Lego Sets: 10212 UCS Imperial Shuttle we're going to be taking a look at what makes up one of these sets, in this case, 7181 TIE Interceptor. When looking at an old and expensive set that you want to buy, how do you decide if what you are getting is what you really need to complete the set? Did you spot a killer set in a box that you aren't sure that it is what you think it is? I enjoy looking at those bulk lot auctions and seeing what I can figure out is in there. In this second article of my Brick by brick series, I'd first like to show you something that caught my eye recently. I initially thought/hoped Vader's TIE Advanced, but looking further at the pictures I realized that it was the TIE Interceptor instead. The blue was what told me that it was not Vader's TIE. The TIE Interceptor, 7181, was released in 2000. The original retail price of this set was $99.99. Used complete sets sell from $250-$350 while New in box sets sell for $625-$700. The box shows a total of 703 pieces. The first reason that this set is not one that you could just assemble from all of your kid's loose bricks is because it is pre-2004 pieces. This means that all of the grays are the old gray. These are not the bluish gray found in modern sets. Some of the pieces may be significantly easier to find in the newer colors, but they will not match the pieces that are unique to this set. When purchasing a used set, beware of someone replacing the old grays with the new bluish grays. Out of 143 unique elements (meaning different part and color) 41 are the old Dark Gray consisting of 242 pieces. 15 are the old Light Gray consisting of 30 pieces. This includes elements from the above list as well as the unique and specialty pieces in the second section below. Even though most of these elements are common and cheap, most vendors on Bricklink do not carry the inventory to cover your needs for these pieces. You'd have to make multiple purchases, pushing the average cost of these pieces up, due to all of the shipping and handling charges. Of course your savvy Bricklinker will know to either have multiple wanted lists running, to spread out their costs, but still a lot of pieces means a lot of separate orders. Apart from the common pieces, you also have some specialty pieces that make up a set. The specialty pieces are ones that are either unique to the set or in so few sets as to make no difference. The unique and specialty pieces in the sets tend to have values that reflect a large proportion of the total value. This causes some collectors to forego the piece in favor of a cheaper alternative, whether it is the same piece in a different color or completely different pieces that serve a similar function. Unethical resellers will replace these pieces and not tell the end users who may not know to look. In some cases, people have made fakes. Spotting fakes is important, but not the focus of this article. For most UCS sets, one of the most expensive pieces is the sticker. The sticker is unique to the set, large and limited in number. Some people require unused sticker, while others are content to have them applied. Unlike later sets, the stickers are not applied to a single large Plate, instead they are applied to 8 of the 1x8 black tile and attached to several 4x8 black tiles. This collection of parts consisting of a used sticker usually runs up to about $50 but may be found in the $20's. A New sticker sheet can be had in the $70-$85 range. I will not discuss the moral ramifications of buying or creating a reproduction sticker for a set that may eventually make it back into the marketplace. I will say that any set with a reproduction sticker should be considered incomplete or even altered if it makes it up for sale. For rare elements I want to start with the big daddy. This piece is the major piece that if it's missing, you've just got a big pile of LEGO. This was the first piece that caught my eye in the above auction. Element 2598px is the Cockpit Windscreen 10 x 10 x 4 Canopy Octagonal with TIE Interceptor Pattern. This piece is unique to this set. They created a different piece for the later Vader's TIE Advanced. This piece sells in the $100 range. There are 6 Dark Gray Bar 4L Element 30374, the same piece used for lightsabers and wands when molded in different colors. There's 25 different sets with this piece in Dark Gray, but it's used in a lot of early UCS sets, so competition for this piece is high. Element 4095 is also exclusive to this set. You need 4 Blue 6.6L Bar with Stop. Each one is going to run you more than $12.50 on average. As of the time of this writing, only a single Vendor on Brickpicker has any, and they only have 2. The next piece is 2 Dark Gray Plate, Round 2 x 2 with Rounded Bottom Element 2654 is available in a massive 4 sets including the UCS Rebel Snowspeeder. They can be had for a low cost because they were available in a very inexpensive set 4097 Mini Robots. The total number of sellers on Bricklink is less than 100. There is a single Dark Gray Cockpit 10 x 10 x 4 Octagonal with Axle Hole Element 2618 which is also unique to this set. There are currently none available for sale on Bricklink and the last 6 month sales average is just above $21.50, with the highest being $28. Next, there are 2 Dark Gray Minifig Utensil Sextant Element 30154that is only available in this and 5976 River Expedition. It's available for less than $1 but the average sale price is closer to $1.50 for a used piece. You also need 10 of a fairly common Element 4151 Black Plate Modified 8 x 8 with Grill. This is notable because of the 32 sets with this piece, only this set, Vader's TIE Advance (16) and the Eifel Tower (13) require more than 4. It averages about $.55 each. 4 Blue Rigid Hose 3mm D. 20L / 16.0cm Element 75c20 are also required. This piece appears in 4 sets, the most recent of which was 2012's Gungan Sub 9499. The relatively recent availability of this set probably drove the price down. Element 3960px4 Dark Gray Dish 4 x 4 Inverted (Radar) with Star Wars TIE Hatch Pattern was available with the TIE Fighter 7146 and the UCS Rebel Blockade Runner 10019. The more common Dark Bluish Gray version is available with 8 sets (Surprise, surprise, all TIE Fighter variants.) The Dark Gray variant is about $.80 on average. Another rare piece, the 4 Dark Gray Bar 1x3 (Radio Handle/Phone handset) Element 6190 is available with a total of 4 sets. UCS Rebel Blockade Runner, UCS Snowspeeder, and 6738 Skateboard Challenge. You're probably going to spend close to $.75 each on these. Only 8 sets have Element 3039pb014 Light Gray Slope 2 x 2 with Horizon Indicator Screen Pattern. It's only about $.20, but unlikely to be in most people's spare parts. Element 3040px2 Dark Gray Slope 2x1 Black Crosshair pattern Green insectoid Pattern is available in 7 sets and averages about $.20. The last thing that many collectors consider when purchasing this set and the most obvious thing that you could see in a bulk lot is the instruction book. Instruction book Bricklink shows 3 of these sold in the last 3 months and 3 currently available. The price guide shows that the sold books range from $25-$35. As I said earlier, all of the Gray Pieces are the older Grays. 1/3 of the set has not been produced in this color for over a decade. Most people don't have that many older Gray pieces laying around. The rare pieces are truly rare and really expensive for a set that is significantly smaller than most UCS sets. All of the specialty pieces and pieces pulled from a small number of older sets are going to increase the number of bricklink orders that you would need to place. Honestly, if you don't already have a handful of key pieces, you should probably just buy a complete one, unless you really do like a long term project. I also feel obliged to mention that this set looks old. 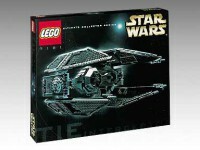 Comparing it to UCS TIE Fighter 75095 it looks blocky and primitive. There's a certain charm to the older sets, and since this is the only official TIE Interceptor, UCS Completists will always have a place for it. It's doubtful that the LEGO Group will be remaking it soon, but I wonder if they ever will. The used price of this set isn't terrible, probably due to the size of the set. Just for fun I'll throw up the rest of the auction pictures and you can see if you can pick out the key pieces, and can you make out the other large set that's in there? In the weeks to come, I will be exploring the pieces that make up each of the Top 25 Most Valuable sets, Ultimate Collector Series, and Modulars. Images in this article are the property of http://rebrickable.com/, Bricklink and LEGO. Thanks, that's so nice. I spent 4 hours writing and linking last night, I know because it was from when the kids went to bed. When I was done I looked at the clock and said, "Dang, it's been 4 hours?" I had to do some quick editing today, and previous to sitting down to write, I can't really tell you. Great resource and enjoyable read. Thanks for the effort and contribution, well done. Very awesome articles! I particularly appreciate the breakdown of the 'ultra rare' parts for these sets, and their approximate values. Reviewing others besides 10179 would still bring this information to the front of the table, which is highly useful to have at a glance! Great writing, great reading. Keep it up! This set is become like the original UCS X-Wing where NISB boxes are far above used prices. Additionally, bricklink prices are higher than avg used price. Regardless whether you buy or bricklink the set, be carefully about brick discoloration especially with the grays. Yes, great stuff. As for 10179, there is tons of info on it out there already... I find these other sets to be much more interesting and useful to cover. Thanks! Looks like there's a walking AtAt in there. congrats on the lot of find! Great review also, very much enjoyed reading it. I'm curious if anyone has tried to turn the new Tie fighter into a Tie interceptor with the cooler color scheme. It would be interesting to see if there are enough pieces in the new tie wing to create a cool interceptor wing. I'm curious if anyone has tried to turn the new Tie fighter into a Tie interceptor with the cooler color scheme. It would be interesting to see if there are enough pieces in the new tie wing to create a cool interceptor wing. I was thinking of that last night as I was writing. Also the lack of a good modern tie interceptor in minifigure scale too. Your reviews of Star Wars sets and these new UCS part-by-part reviews are great. They add a lot to the site and I really like them, and they complement the brickset reviews quite well. I hope this continues on the site. There's been some discussion of expanding into modulators, etc. All of the contributors are most concerned about adding quality content. For me, I plan to continue doing articles like you mention, as time permits, until people tell me that I am doing a bad job, or someone better comes along. I want to thank everyone for all of the positive feedback. I am going to try for once a week on both reviews and set analysis. Now imagine that there use to be time when some local kmarts were closing and this set was on clearance at %50off back in the day, I still remember seeing it on shelf at that price. when I was still buying bulk lots I managed to buy on eBay a lot that slipped completely under everybody's radar with a ton of good sets with instructions, this listing had a really poor title and description but I found gold in pics. paid about $300, I planned on building the sets and selling them separatelybut gave up on that and just resold it on eBay for about $950. This is a fantastic series, thanks for putting in the time and effort! I'm toying with the idea of Bricklinking a 10018 Darth Maul set. I've already got my wishlists up, but I'm waiting for the few rarer pieces to pop up at a reasonable price (and from a seller with many of the more common bricks needed in large quantities) to kick things off. I was able to snag a Motorized AT-AT off of Craigslist last fall, look out for all the discolored pieces that will show up in the lot you purchased. I didn't take the time to Retrobright the pieces, as I was able to flip it for a decent short term profit. Are you planning to try to "fix" or replace the discolored bricks, if there are any? I didn't wind up getting this lot. I look through lots like this and play a game where I try to figure out what's in there based on context clues. It's super nerdy and a little OCD. If I like what I see, I take a stab at it, sometimes I get them, sometimes I don't. Usually I learn something as I go through the sets and pictures. My very first large bulk lot, I mistook a picture of clone pilots for AT-AT Drivers. I've learned a few things in the years since then. I was out bid on this lot but what TWO good sets can you see parts of? @thoroakenfelder : how many sealed bags you have for the 7181? Anyway congrats for your work, amazing! Thanks, Working on 10123 now and started analysis of 10030, so those should be the next 2 in the series. Thank you for putting this all together. I was surfing EBay and ran across one, that appeared to be in excellent condition. This set caught my eye but, predates my collecting. Your article answered every question I had. Thank you very much and keep up the great work.